12z UKIE looking very interesting for middle of next week. EURO came in a bit colder. A general 4-5 inches across the area before a change to sleet and rain. For the Monday-Tuesday event, 24-36 hours ago the weather channel had the high on Tuesday near 40 for my area (Central Jersey). Now it's 35 with 3-5 inches of the white gold before changeover. Sounds like moving in the right direction to me! Woke up today to a changed forecast leaning to a warmer outcome and more rain then snow. Oh well, another one bites the dust. Irish wrote: Woke up today to a changed forecast leaning to a warmer outcome and more rain then snow. Oh well, another one bites the dust. Yes, noticed that up here too.It was all snow to snow/sleet than back to snow.Now its snow to sleet to FR.That's been the pattern all winter, warmer solutions. I think ePA can do 3-5” snowfall between Sunday night and Tuesday morning. Could be significant icing after it taints which is greater concern. It most likely goes to rain though. It’s after this that we have better chances. The cutter pattern has been relentless but mjo phase traversal supposed to help that. Edit 3-5” might be better call attm. heehaw453 wrote: I think ePA can do 3-5” snowfall between Sunday night and Tuesday morning. Could be significant icing after it taints which is greater concern. It most likely goes to rain though. Now we may have to worry about lack of cold air no? Cold air at surface will be plentiful especially away from the coast. 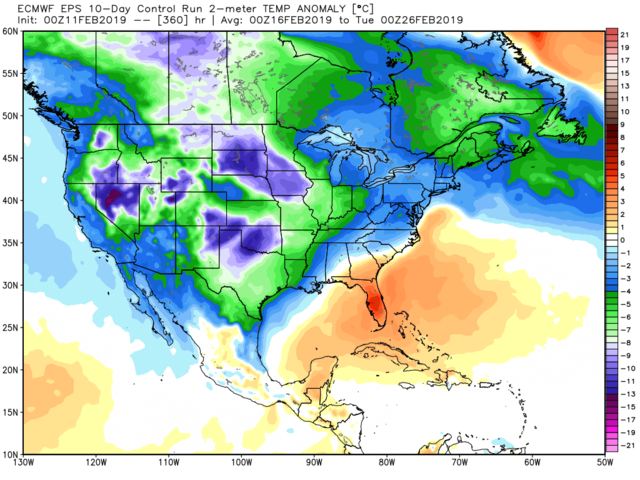 How long do we hang on to the cold at the mid levels? Don’t know but I liked last night’s Euro run. A strong high pressure parked in Lower Quebec may surprise us with more cold than modeled. heehaw453 wrote: Cold air at surface will be plentiful especially away from the coast. 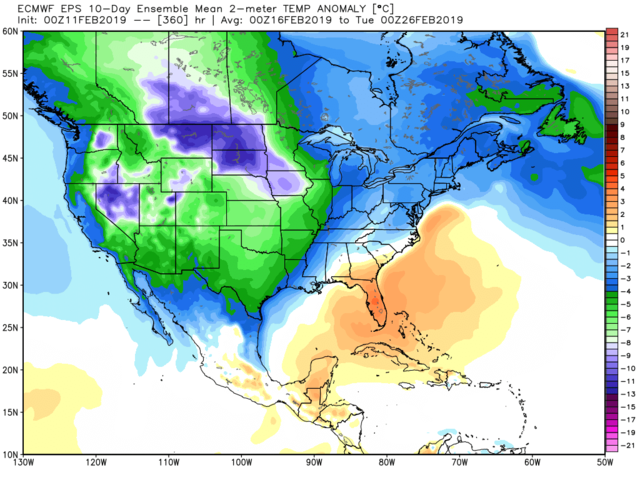 How long do we hang on to the cold at the mid levels? Don’t know but I liked last night’s Euro run. A strong high pressure parked in Lower Quebec may surprise us with more cold than modeled. Sorry I meant more for after this threat. Cold air seems to be lacking in our area afterwards as well. Great question. Probably depends on MJO, blocking and EPO. I’m hopeful that things get exciting around here soon. Tempered hope. Nam has a little snow for Sunday night and then snow/sleet to a little rain with the bigger storm for mid week with a few inches of " frozen precip " for the coast with a little more inland. What I noticed about Tues temps is the day and night temps are mirroring each other. I see 25/25 and now 29/29 (showing a warming trend). I am surprised to see temps forecast that are so Frick 'n Frack. Timing may be everything for impacts Tuesday as well. While both the GFS and NAM show a snow to frz/sleet to rain solution, the duration of frozen precip is fairly long and hits between about midnight and late morning/midday Tuesday. That means at the AM rush it may still be snowing or a mix of snow sleet and frz rain for many. By the time it goes to all rain the damage may be done (ie morning commute disrupted, schools closed etc). So even if you only get 2-4” on the front end then icing or sleet before being washed away by rain in the afternoon the timing may cause bigger problems. At a wedding and NAM depicted a v-day special ala '06. 2-4" snow NNJ and then about 1" of sleet and their before a changeover and then temp crash after. Complex set up.. Need a thread,someone please start one from sun through Tuesday. Sun into Mom about 1" in NYC and 2-3" S of there. 100% Skins. Here is the snap shot of the equatorial Pac in the region the SOI is calculated at day five. 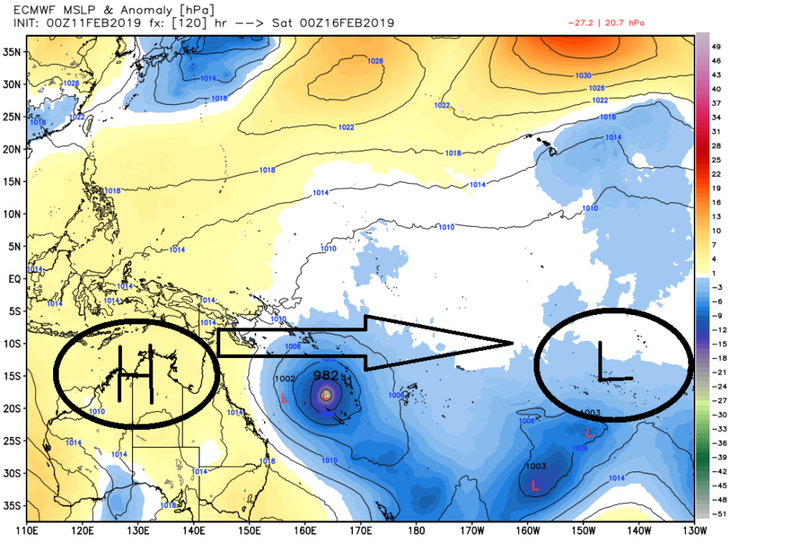 Between now and then the pressure anomalies cont to favor HP over Darwin relative to the LP over Tahiti. Result is a net increase to westerly motion to the trade winds. Something we have not had this winter. It also looks to persist on the modeling for the following 5 days as well. This is what we are supposed to have in an El Nino winter. For the first time all winter the MJO and, ENSO (weak El Nino), look to align themselves as seen in the OLR maps. You can see the center of the convection is now around the dateline or perhaps just west as of this am. And you can see the connection of the Eq Pac convection and the STJ stream extending into the SW CONUS. This is more typical of El Nino. The cool colors indicate where the convection is. 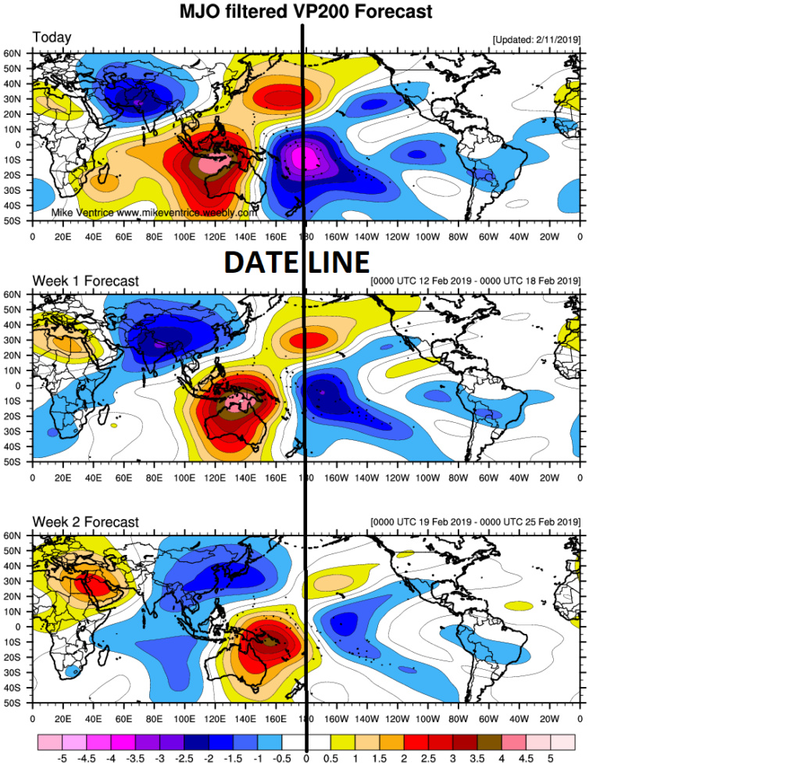 But the forecasts from the MJO plots to the 200mb velocity potential maps conts to show the eastward propagation of this current MJO pulse into the phase 8-1-2 phases. All things that tell me winter IS NOT OVER.